First of all I hope that everyone had a wonderful Mother’s Day! We had a memorable one around my house between my wife, children, and a visit from my mother-in law and a friend of hers. As I once heard a mother can do a lot of jobs but nobody can replace our mother. We have a lot going on in the coming weeks and I thought that I’d make you aware of a few things going on. The first Rhetorik-Word Weavers Open House on April 30th was a resounding success. I haven't seen how many people attended but I would guess around 30 people all together were there. Our first meeting of the month is on May 14th. I won’t be there but there are speeches planned from Andrea and Norbert have speeches planned. There might be room for another speech and several roles are open (including the Toastmaster, General Evaluator, all of the Evaluators, and so on). Andrea, will be informing the club about the Officer Nomination Results and we’ll hold the election on May 28th. I’m getting ready for the D59 Spring Conference in Krakow. We’re having our annual BBQ on May 21st. 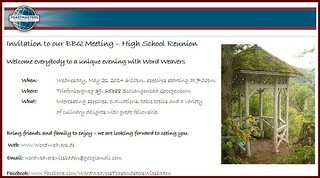 We decided to add a theme of “High School Reunion” and invite longtime members to join us as well as members from other area clubs. So that I can have a good idea of how many people are going to come to the BBQ, it would be great if you could indicate on EasySpeak that you’re going to make it (or not if you can’t). You can also send me an email as well. This evening will be a little different than our normal meetings but I still need people to take on some roles. We need a General Evaluator, a Table Topics Master (I’ll help you with the questions). Is there anyone that would like to give a speech, I’d really like to get some of the longtime members (i.e. Martin, Regina, etc). Anyone else interested in giving a speech let me know and I’ll point you in the right direction. We’ll need evaluators for the speeches but these won’t be presented during the reports and they’ll be more so that our speakers can get credit for their speech projects. This should be a very fun and memorable evening. I’m looking forward to seeing you all there. Our last meeting of the month will be on May 28th. Andrea has a speech planned and I’ll be doing the last project out of my “Speaking to Inform” manual. We’ll hold Officers Elections for the 2014-15 Toastmaster year. Our first meeting in June will be on the 11th. Since we’ll be well into the World Cup by then, I was thinking that we could have a World Cup themed evening. I’m open to ideas. Looks like May is going to be another fun month a Word Weavers. I look forward to seeing all of you.